Ever wanted to build an outdoor fire pit? Who doesn’t? I can dream of s’mores and chilling on a cool fall evening with a beer and great friends…. yes, fire pit = awesome idea. Want to make one yourself? 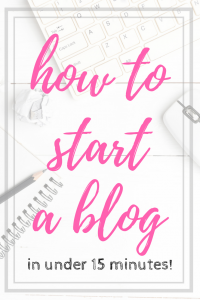 They’re pretty simple – and you only need a few things to create one yourself in about an hour. Stones – I found mine at Lowe’s Home Improvement. They’re the same ones we used for our retaining walls on the front side of our home, so they match and stuff. We used 14 in each layer – adding up to 42 stones all together. I used a concrete based “stone” – but there is a chance of breaking when heated. Use firesafe stone or a fire box insert to prevent any damage. Lava Rock – Also found at Lowe’s. We got this in the garden center close to the stones. Shovel – we chose a flat tip to scrape up the grass easier. Level – we used a 3 ft. one. Ice Water – lots of hydration, yo! It’s not really for the fire pit – but after all that digging you’ll need it. Put one layer of stones in a circle where you want the pit to be. Use a shovel and mark the ground all the way around the stones, then remove them. Shave all of the grass off the top, going under the roots. Make sure the area is level before replacing stones. In alternating rows, place three layers of stones to create your pit. Fill bottom with lava rock and you’re done. Enjoy your new outdoor fire pit! It was a little confusing to show in photos, so I created a time lapse video on how to build a fire pit. Great video! Loved it! You have great ideas! 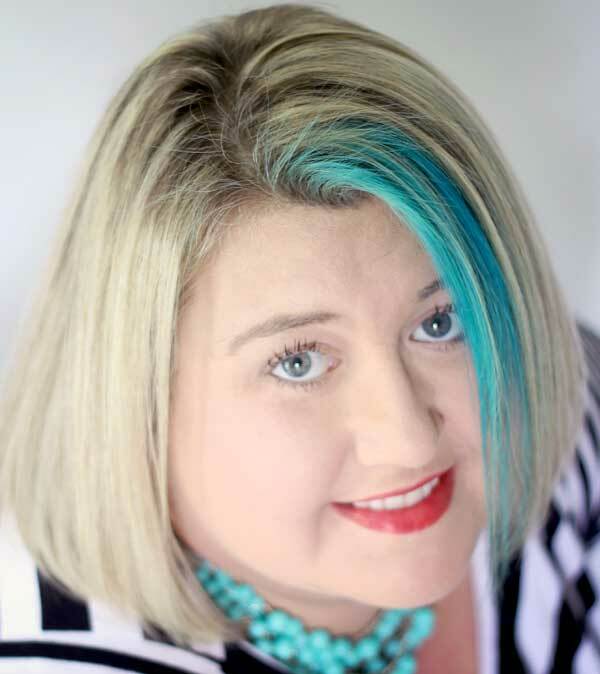 Wanted to tell you I pinned it and love your blog! Thanks for sharing this! Can this be “built” on a cement patio? I wouldn’t build this on a patio….damp concrete + fire = cracked (or even exploding) concrete. If you’re going to do this on a patio, a nice layer of fire brick as a base is strongly recommended. 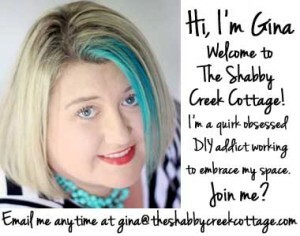 Gina, thanks for sharing your video I loved it. Can’t wait to try this in my yard. I’m building one. TODAY! I’ve been reading and reading about how it’s done, but your wonderful video gave me the oomph I needed, to just *%$# do it. Thank you, Gina! Go for it Dee!! Perfect time of year to enjoy it 🙂 Good luck! Loved your video…what I could see of it. youtube’s aggressive ad placement interacted badly with the scripts on your site. Net result, I got to see about 1/3 of your video interspersed with a black screen as youtube attempted to make me wish I had “premium” service and therefore no ads. Just a heads up. Good to know, thanks Bryan! The video is awesome but why so much ads? Thanks Ivanka 🙂 The ads help fund my site as it takes a lot of money to run it. 1) Are you able to send a link to the exact stone you got at Lowe’s? 2) What diameter firepit did 14 of those stones per level result in? 3) You mention the possibility of the stone breaking when heated because it’s not fireproof. Have you had any breakage since you began using the pit? I’m so glad you like my fire pit post 🙂 It is super easy and provides so much fun family time! To answer your questions, I do not have a link to the stones we used, we just picked what looked appealing to us but I don’t recall the name. Our fire pit is 5 feet diameter. We have not had any issues with cracking from the heat and we have had it for a few years and used it plenty! I hope that helps 🙂 Good luck! What an awesome time lapse video, and the finished fire pit looks great, awesome job! Thanks so much Spencer! It was super easy and we love it!! I’m so glad you made it Dash and hope you enjoy yours as much as we do ours! You mention a “fire box insert”. Is this the same as a “fire pit insert”? Yes, sorry Kate typo 🙂 Fire pit insert 🙂 Thanks so much! If you put down lava rock inside, how do you clean out the ashes? We’ve never had a issue with ours, if there is a large amount we just scoop them into a shovel and dump them….always making sure they are completely out of coarse!! How much lava rock was needed? thanks! thanks so much for the video! you make it seem so easy to do! one question though, you said your pit was 5 feet, is that from the outside of the stone or the inside? Thanks so much Concetta! The 5 ft is from the outside of the stones. Good luck! I am wondering if it is nessesary to dig up the grass first? Is there a reason you didn’t just build on top of the grass? Could you give an approximate price for all the materials? Love it! I think the whole project was less than $100.00, so worth it!! How many pounds of Lava Rocks did you use? I love this fire pit project! I’m working on a post about DIY fire pits and was wondering if I could use one of your pictures on my site. (I would have just emailed you but I can’t find a contact form or email anywhere.) I would give you credit and include a link back to your post. Please let me know if that’s all right. If not, no big deal. What was the total cost for the project? If it gets too full just scoop it out with a small shovel into a bucket and dispose of it, we never really have had to do that though. 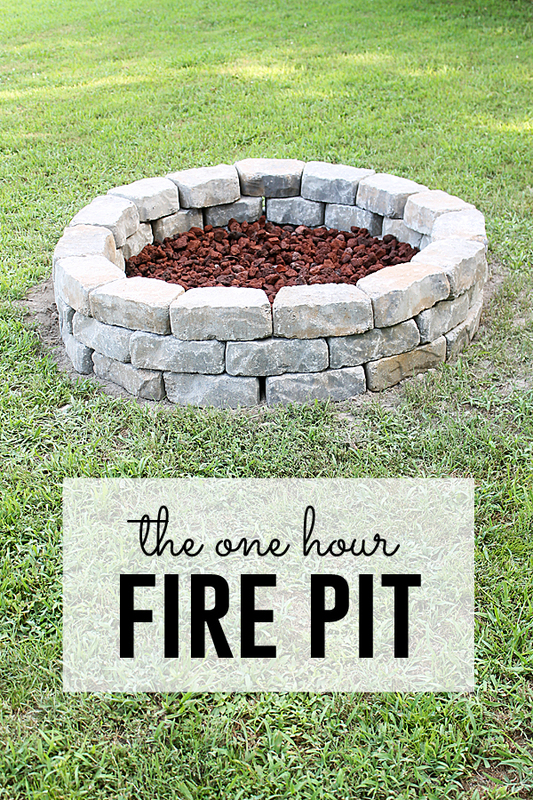 Thanks for finally talking about >Fire Pit Project (you can do in one hour!) <Liked it! This is an awesome project for me and my kids next holiday! We always look for outdoor activities.